The Cycloramic iPhone 5 app shoots hands-free panoramic videos and saves them to your camera roll. It is shockingly simple and efficient to use. All you need is your iPhone 5 without a case, a flat surface, and a quick adjustment in your settings menu. It is currently only optimized for the iPhone 5, but the developers at Egos Ventures Inc. plan to create a version for the iPhone 4 and 4S. The Cycloramic iPhone 5 app opens to a screen that quickly tells you to remove any case or accoutrements and set the phone to vibrate. It would be helpful to add a couple of additional notes that are found when you read about the tools and functions in its online marketing materials. Specifically, the settings adjustments should be outlined, as you need to make sure both vibrate options are allowed. It would be a great idea to have a tutorial screen or two to walk you through the steps to take before the Cycloramic iPhone 5 app opens its camera. The Cycloramic iPhone 5 app also requires an extremely flat and smooth surface. I tried it on a wood dining room table, a kitchen counter, and a glass surface. The glass surface had the best results, but you’ll want to try it in a few places to get the hang of it. An extremely smooth, level surface is key. The in-app camera for the Cycloramic iPhone 5 app has simple interface. You can set how much of a panoramic you want by touching the number in the bottom of the screen. You can select from 360, 720, and 1080 degrees. You just tap the screen until the appropriate number pops up. You can reverse the direction of the camera with a touch, and you can access your camera roll with a touch. You press the word go that fills the middle of the screen to shoot a panoramic video. There is a three second countdown, and it starts. The iPhone 5 gradually pivots on its base. It is super cool. You can touch and view your videos that are surprisingly smooth despite the pivots required to shoot the video. The Cycloramic iPhone 5 hands-free video app does not currently support audio. This is a great tool for a cocktail party, but also there are so many uses for marketing, sales, and real estate professionals. For a $.99 download, it is a bargain to add to your video iOS app arsenal. 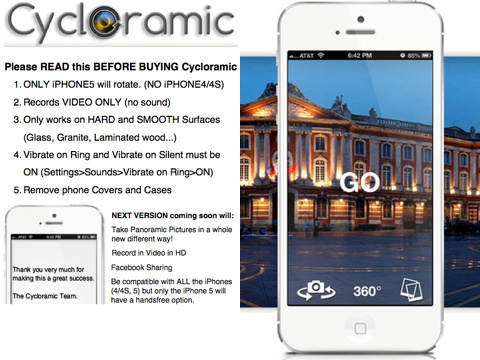 AppSafari review of Cycloramic was written by Jenni Ward on January 3rd, 2013 and categorized under App Store, Photos, Utilities, Video. Page viewed 5284 times, 2 so far today. Need help on using these apps? Please read the Help Page.